Our Home is YOUR HOME Away from Home. *No Events allowed. We invite everyone to come and nurture the art of life at Bonne Terre. Get away from it all and connect to Louisiana's Cajun and Creole countryside right outside of Lafayette, Louisiana. Many artists, musicians, nature lovers, and adventurous souls have come to pause here in their travels and gone away nourished in mind, body, and spirit. Come see why. Our peaceful farm is a great retreat – excellent for the fine art of relaxing - with lots of natural light and many amenities. Our setting is pastoral and we're within easy reach of so much of south Louisiana's great food, music and culture. Come stay for a weekend, week, or more and experience Bonne Terre. NO EVENTS. No Weddings, Showers, Parties, etc. No Exceptions. *All guests must be 24 or older. No Smoking. No Children or Pets of any kind. We’re organic gardeners, naturalists and music lovers. 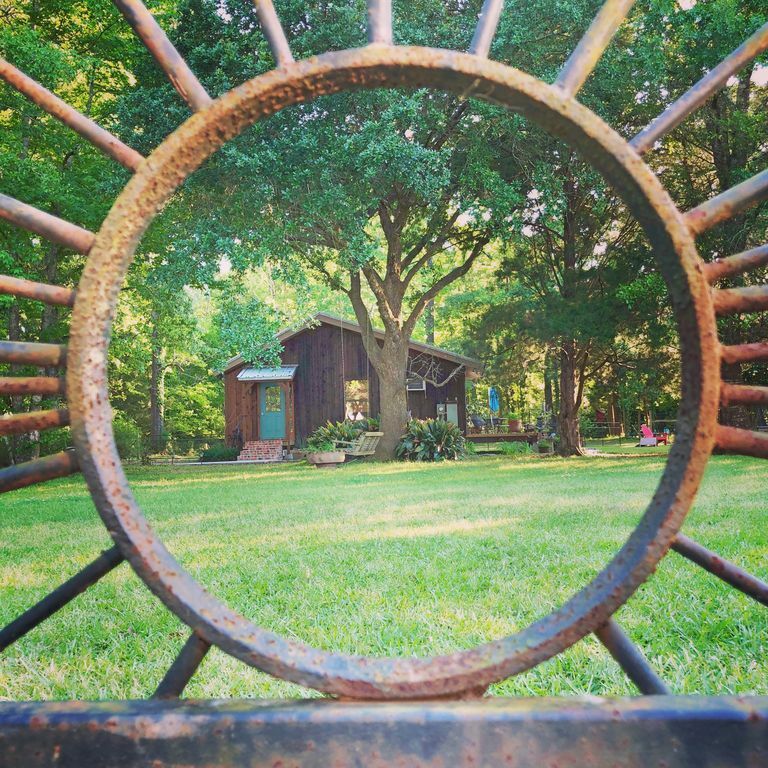 Our lovely hundred year-old Main House, Cedar Studio and passive-solar Cottage, are retreats/rentals for anyone looking for a place to rest, discover, create or just be. Our ten-acre country farm is located at Poché Bridge, just north of Breaux Bridge and right outside Lafayette. Bonne Terre is located in the small community of Poché Bridge, ten minutes from Breaux Bridge and twelve miles outside Lafayette. When you set your bag down at Bonne Terre, it feels like home – without the distractions. Here is a place to breathe; to slow down; to nourish your roots. We’re a tranquil space in the center of south Louisiana’s vibrant cultures and breathtaking natural environment. Our incredible cuisine, amazing local music and one-of-a-kind attractions make our home a very special corner of the universe. Bonne Terre Cottage contributes to a healthier planet by utilizing green household products such as energy efficient light bulbs, a programmable thermostat, an Energy Star-rated central AC/Heat pump, ceiling fans, energy-efficient windows and eco-friendly cleaning products and laundry detergent. We cultivate an organic garden, tend a small orchard and a flock of free range chickens. Our 10-acre homestead, which includes a two-acre woodlot, is a National Wildlife Federation certified wildlife habitat. We provide our guests with, recycling bins, a kitchen compost pail for organic waste, 100% cotton linens, natural soaps and sprays created by local artisans, Organic and Fair Trade Certified food products, cloth napkins. non-disposable dishes, access to books, music and DVDs by Louisiana artists and a non-smoking environment. Sorry, we do not book for events. We do allow wedding, showers, or parties. Built as a musician’s studio, the Studio has its own space, yard, firepit and now, its own kitchen and bathroom. We support artisans/artists, and their beautiful hand-made art. Cypress cabinets and table, hand-blown glass and up-cycled lights, hand-forged hooks and draw pulls, locally-made railings, music and art by Louisiana artists are what we think makes Bonne Terre the fa-sheezy place that it is. Come discover, create or just be. Set back near the woods, there is a wrap-around deck and shaded outdoor sitting areas for bird-watching and enjoying the outdoors. Comfortable swing near studio for morning or afternoon coffee or just daydreaming. Bathroom – Shower, pedestal sink, toilet. Linens and towels provided. Guests are treated to locally made artisan-made soaps and sprays. Other amenities include washer, dryer, iron/ironing board, hair dryer, chest of drawers, and plenty of closet hanging space. Water-efficient toilet, faucet, and shower head. Studio space is comfortably settled in a rural Louisiana landscape to leave the lightest impact on the environment. Our 10-acre homestead includes a two-acre woodlot. Energy-Star rated air-conditioning/heat and ceiling fan keeps the studio comfortable year round. Towels and linens provided to guests. Parking at Studio. Four brick steps up to studio. An assortment of towels provided for my guests. New refrigerator. Sorry, no ice maker. * No ice chests inside please. Keep on porch. Electric stove. Tea kettle. Plenty of pots and baking pans. Cooking, yes! Frying, OUTSIDE only. A fryer for outside can be provided by your host. Just ask please. Electric oven. Plenty of baking pans. Four cup Coffee Maker and coffee grinder. Guest provided with locally roasted organic coffee. Local organic coffee provided along with a selection of organic teas. We care deeply about the environment, so we have a wide assortment of dishes, glassware, utensils, cloth napkins. Everything needed to create a home-cooked meal Coffee maker & grinder, blender, a wide assortment of dishes, glassware, pots, pans, & utensils, cloth napkins. Dining table seats two. Table seats two very comfortably. Outdoor dining table too. Vinyl, music but local musicians and a wide assortment of CD's. DVD's, many about Louisiana artists , travel and culture. The Studio is located next to our small orchard, and near the woods of our ten-acre farm. Welcome to Bonne Terre. We make a huge effort to provide our guests with many things they might need for a comfortable stay. Please help yourself to what you need, then leave the rest for the guest that will visit after you. That’s what the former guest did for you! Please do not wander beyond your yard and the gates. These areas are off limits to our guests. Please do not feed our animals without inquiring first. No children, pets, or guests under age 24. All guests under the age of 24 need pre-approval by owner to stay at Bonne Terre. Our residences are not wheelchair accessible. Guests may be tempted to invite friends over, but this is not allowed. Strict policy. Jen was an incredible host. Her property is stunning, the studio is very private, and well-stocked with lovely local amenities, including milk and eggs straight from the farm! We never wanted to leave and can't wait to come back! Thank y’all so much for coming & taking the time to write such a lovely review! I loved having you here at Bonne Terre. One quick clarification. The eggs are from the farm but the milk is from Our local grocer! Thanks again and come back any time! My husband and I stayed here for a Valentine's Day weekend getaway. We could not have been more happy with our choice! I can't say enough about Bonne Terre! I knew it was the place for us the minute we drove in. It is so peaceful and beautiful. Jen is the most gracious and wonderful host. Her attention to detail is the best! We stayed in the Studio, and it had all the comforts of home. It is adorable, decorated beautifully, and a true home away from home. We loved sitting out by the fire pit at night, and our visits from Bruce the cat. She is a friendly girl. We also loved listened to music on the turntable at night while we drank some wine. If you are an animal lover, Bonne Terre is the place for you! We had several great meals. Cafe Sydnie Mae is a must in Breaux Bridge- try the Teche Wellington. Another favorite meal was at Cafe Josephine in Sunset. Some really great antique stores there as well. Also had a great brunch at French Press in Lafayette the day we left. Highly recommend it too. We can't wait to get back some time this year. It truly is a cajun paradise! Jen is a ray of sunshine! Book at Bonne Terre and you'll see what I mean. Thanks Jen! Thank y’all so much!!! I’m so happy you two enjoyed exploring Acadiana and hanging out here at the Studio. Please come back any time and thanks again for being such kind & thoughtful guests and, for such a complementary review. I so appreciate you! The studio apartment is spotless, well stocked with everything you could need, comfortable and beautifully decorated. Lots of beautiful wood paneling and trim makes it feel like a cabin in the woods. The host is exceptionally gracious and helpful. If you like to cook, the kitchen has everything you need..it is better stocked than my own kitchen at home. There is a wonderful assortment of books to read including many on the history of the area and many movies to watch. The setting is so quiet and peaceful. The only thing we ever heard was an occasional crowing of the roosters. If you have time, ask for a brief tour of the farm and meet the fancy chickens, goats, horses and cow. Thank you so much! I’m so happy you enjoyed your stay here at Bonne Terre. Come back any time. A home away for home!!! The best "feel good" atmospheres I've experienced!! Get away from it all and connect to Louisiana's Cajun and Creole countryside right outside of Lafayette, Louisiana. Our peaceful farm is a great vacation spot/retreat – excellent for the fine art of relaxing - with lots of natural light and many amenities. Our setting is pastoral and we're within easy reach of so much of south Louisiana's great food, music and culture. Bonne Terre is located about four miles from Breaux Bridge. This quaint little town has an amazing coffee house (Joie de Vivre) that serves delicious breakfast & lunch daily with dinner & music by local musicians on weekends. JDV also hosts a Saturday morning Cajun jam. Buck and Johnny's Pizza, is the home of the Zydeco Breakfast. Check it out on Saturday mornings. So much to see, hear and do! There are also lots of antique shops for bargain hunting and best of all, the friendliest people any where around. For those who love the great outdoors, the Bayou Teche which runs through the town of Breaux Bridges (Bayou Teche Experience for rentals) and Lake Martin and The Atchafalaya Basin are just a few miles away. And, if you love birds, you're definitely at the right place. Bayou Teche Visitor Center, right near the bridge in town, and Atchafalaya Welcome Center are both great places to learn more about our area. Plan a swamp tour. Take a tour of a plantation home, as there are several within a sixty mile radius. There are several little towns to explore nearby - New Iberia (Books along the Teche -best small book store, with many James Lee Burke novels) , St. Martinville,(Longfellow Evangeline State Historic Site Arnaudville (NuNu Arts and Culture Collective), Grand Coteau, & Sunset, (home of Water Oak Farms, The Funky Flea and Jerilyn's Glass Studio) just to name a few, all interesting places to discover and enjoy. Rates are subject to change until reservation is confirmed. All Guests must be over the age of 24, No smoking inside, No pets or children allowed. NO EXCEPTIONS. Only guests named on the contract are allowed at our rental/farm. Thank you.